Chances are, you already pet your cat. Similar to what you do, cat massage is achieved by using a combination of specific hand parts, hand positions, motions, pressures and speed. But cat massage takes petting a step further: "When we add detail and finesse to our touch, we upgrade petting to massage," explains Ballner, a licensed massage therapist and author of Cat Massage: A Whiskers to Tail Guide to Your Cat’s Ultimate Petting Experience (Griffin 1997). Ballner advocates cat massage techniques that primarily deepen the human-pet bond. 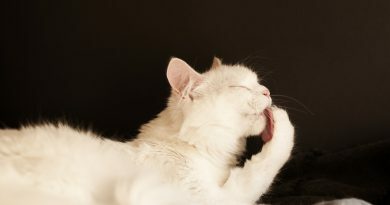 Feline reflexology, a different form of cat massage, encourages the body’s innate healing ability. Based on the theory that the paws, feet and head are a perfect map of the whole body, reflexology is a system of massage techniques that reduce tension and prevent stress-related illnesses. "Stress contributes to 80 percent of all major illnesses, and reflexology acts as a way to minimize the stress," explains Jackie Segers, certified holistic health practitioner and author of Reflexology for Cats (Bateman 2007). Gently stroke the middle of the forehead, from between the eyes to the top of the head. According to Segers, this movement may affect the pituitary gland and brain function. With your full palm, slowly caress from throat to chin. Cats will crane their head up in approval. "You may also want to try light rhythmic finger tapping under the chin," adds Segers. "It’s both soothing and stimulating, and it has a direct influence on everything in the pelvis." Massage in small circles around the sides of the mouth and chin. Reflexology holds that this promotes good digestion. Notice your cat’s natural routine. 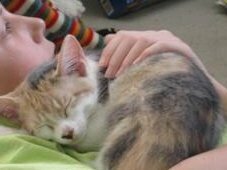 Then, "choose a time when your feline friend is resting and is not playful or aggressive," says Segers. She suggests bedtime or nap time for any touch therapy. Because cats react to the moods of their human companions, be sure that you’re also relaxed. Feeling stressed? Postpone the session. "Never restrain your cat or force touch," warns Segers. Instead, approach your pet gently, "with love and an open heart so it can feel your intention to help." As a first non-threatening step, drop your hand to its eye level and near its cheeks. "This is where scent glands are located, so cats are marking you at the same time you’re touching them," says Ballner. Respect your pet when it’s had enough. According to Ballner, the slower you touch, the more your cat will respond. Even better, remember "no-mo" (no motion), says Ballner. "Simply rest your hand next to your cat, on top of him or even under him and stay still. Learn to just be with your cat." Turn off the TV, music and cell phone. Dedicate four whole minutes to massaging your cat at the same time every day, Ballner suggests. Be patient and when you find a technique your cat likes, stick with it. Your cat will come to expect it and will want to share each day’s favorite moments with you. "Since we don’t speak fluent ‘Meow,’ the best way we communicate with our felines is through touch, and the best possible touch is massage," concludes Ballner. "Our cats deserve the best of everything."